The winner of this giveaway is Kathy S., who likes lilacs. Thanks to everyone for participating! 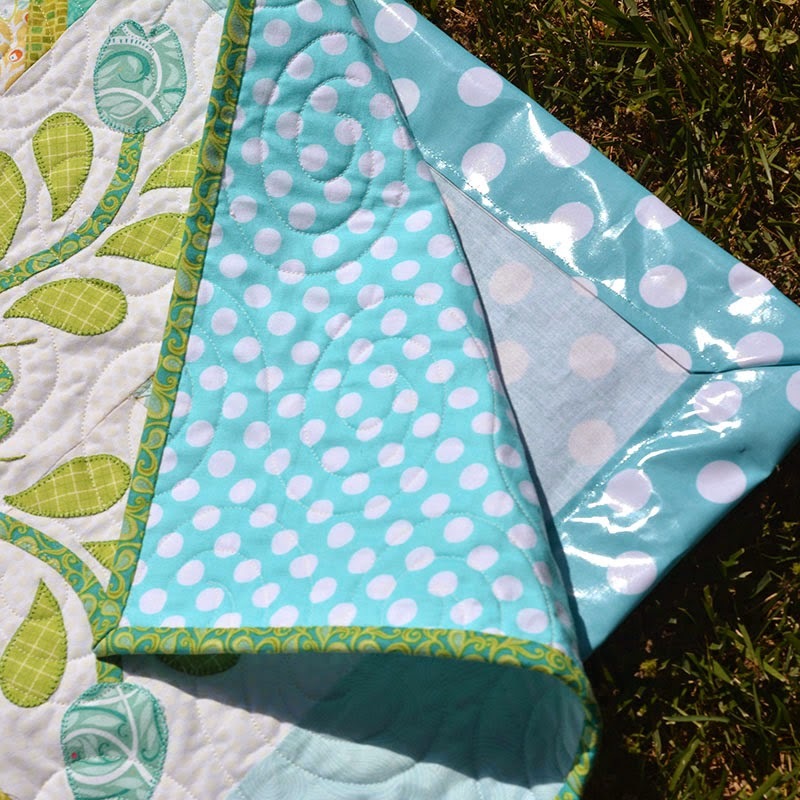 Well, it is day 4 of Sew We Quilt's Perfect Picnic blog hop and it is my day to post! This quilt was inspired by the ladybugs that always make their way into our daughter's room for two week in the spring. They love her sunny window but drive her crazy! Because the motifs were fairly bold, I kept the colors soft. The fabrics are from my Bella, Topiary, and Bonjour Mon Ami lines for Blend Fabrics, and some Vanessa Christenson prints, all thrown together. I'm thinking that I might put this together as a PDF-only pattern - what do you think? Riley Blake makes this wonderful polka-dot laminate in a variety of colors. The aqua matches perfectly. I pieced it and turned under the edges and tacked it on the back of the quilt. That way I can just remove it when it might need a wash! For our picnic we had homemade lattes and sweet potato apple muffins! Now for the giveaway. I'm going to be giving away a copy of my new pattern, "Flower Power". Just leave me a comment on this post telling me what your favorite flower is, okay? Deadline is the end of the blog hop - Monday the 9th at midnight. 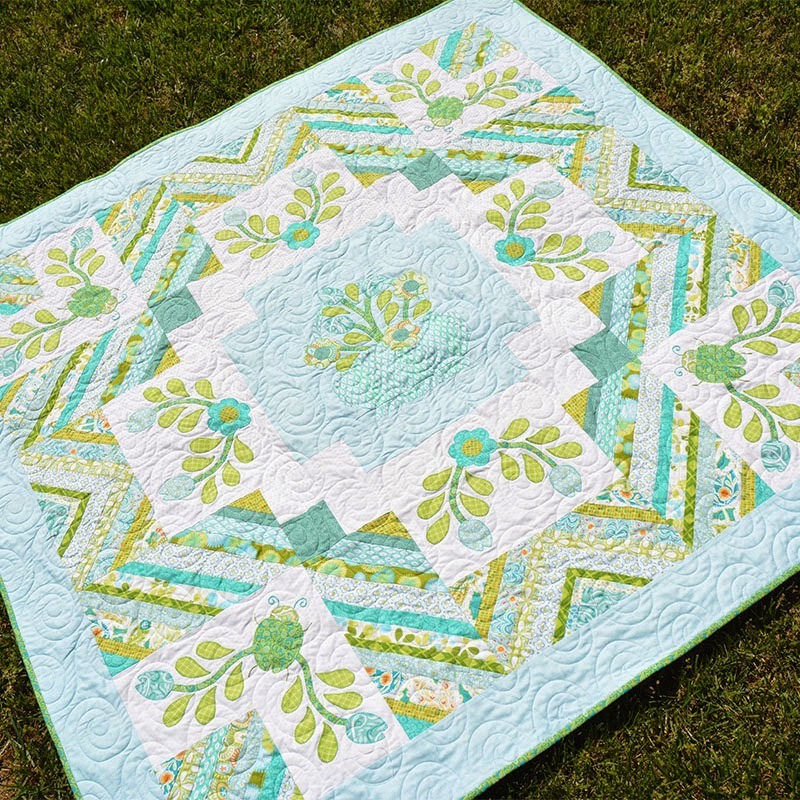 Thanks so much to Cori from Chitter Chatter Designs, Mary from I Piece 2-Mary, Riley Blake Designs, and Madame Samm of Sew We Quilt for making this blog hop possible. Don't forget to stop by and see all of the wonderful entries on the bloghop! Favourite flower is hydrangeas in blue! What an absolutely beautiful quilt! In the summer, I love my patch of zinnias for fresh bouquets. Amanda, the colors are beautiful and the stitching is so pretty. That ladybug just makes it. I really the herringbone too. I like it all. My favorite flower is a pink peony. The new pattern is so sweet in such great colors. My favorite flower is the daffodil :) I love the colors you used, never heard of Quads but am going to look for it (we enjoy all sorts of games) and thank you for sharing your picnic Amanda! My favourite flower is the cala lilly. An amazing quilt, so beautiful! My favorite flower is Forgetmenot. Your quilt is wonderful. Love the story of the Lady Bugs. Love, Lily of the Valley. Thank you for being part of the "Perfect Picnic" hop. What a gorgeous quilt! I like lots of flowers but I'll say roses are my favourite (for today anyway!). Thanks for the lovely giveaway. Amanda your quilt is exquisite - I love it! My favourite flower is the sweet pea! My favorite flower comes from a bush -- lilac. Love the way you utilized strings in the Ladybug Picnic. I don't remember the song, but I need to Google it now. Thanks for the chance to win. My favourite flowers are pansies - they alway look as if they are smiling and I love the velvet colours/texture of the flowers. Beautiful quilt/picnic rug. My favourite flower is a little viola called Johnny Jump-ups or Heartsease. Amanda your Quilt is absolutely stunning! and in my favorite colors too!! Your detail never ceases to amaze me~ I am a Calla Lilly Girl. Very cute quilt. I remember that song. My kids loved it. One two three four five six seven eight nine ten eleven twelve ladybugs went to the ladybug's picnic. Outside Spring would be Tulips, Summer Sunflowers but inside Orchids win hands down. Although I love my Christmas Cactus. Lilacs! Beautiful colors and they smell glorious. I love your ladybug picnic quilt! and the fabrics and colors are so yummy! My favorite flower is the tulip but we can't have them here for the voles. They eat every last one we try to have. My favorite flower has always been the black-eyed susan because I grew up on a farm and they were everywhere! I just love Gerber Daisies. I grew them last year but they were mostly food for deer. So frustrating! This year I'm trying Dahlias surrounded by yellow marigolds which deer supposedly don't like. So far so good. Gorgeous quilt, thanks for sharing! Your quilt is lovely. The colours and appliqué and the herringbone play off each other so well. My favourite flowers are tulips. 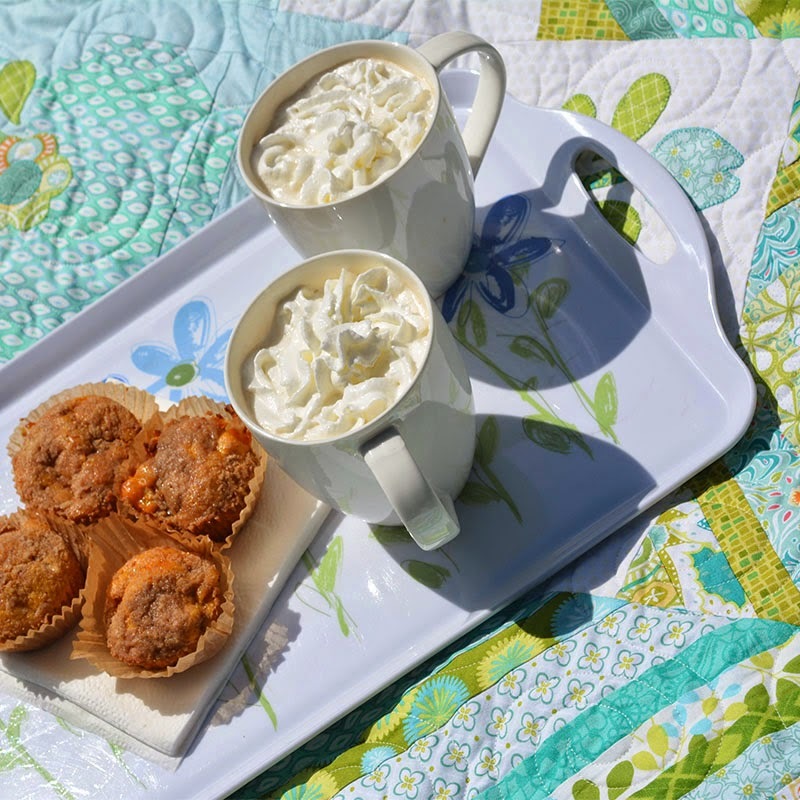 I love someone who has lattes on a picnic...totally awesome...ladybug picnic is sweet to the eyes..
Amanda, your quilt is stunning! I love the muted color palate. My favorite flower is the Sunflower. My favorite flower is the sunflower! Love your designs! thank you! LOL, as soon as I read the name of your quilt, that lady bug song got into my head. I hear it often, and yes, it's from Sesame street and I have a 2 yr old who enjoys it :) Lovely quilt! I am rose fan, followed closely by the daisy. Gorgeous quilt! Yummy muffins. I'm with your daughter, the ladybugs drive me crazy in the spring as well =) Hard to decide on a fav flower, but this time of year it would be lily of the valley...it is everywhere in my yard and I just love the fragrance! My favourite flower is the tulip and especially red and orange....not very surprising I think...because I´m Dutch! Toooooo many pretty flowers to choose from this time of year........at the moment my favorite is PEONY!!!!!!!!!! Your design is lovely as always Amanda ! Lattes and sweet potatoes muffins....a fabulous choice ! My favorite flowers are Texas bluebonnets and Indian Paint Brushes. 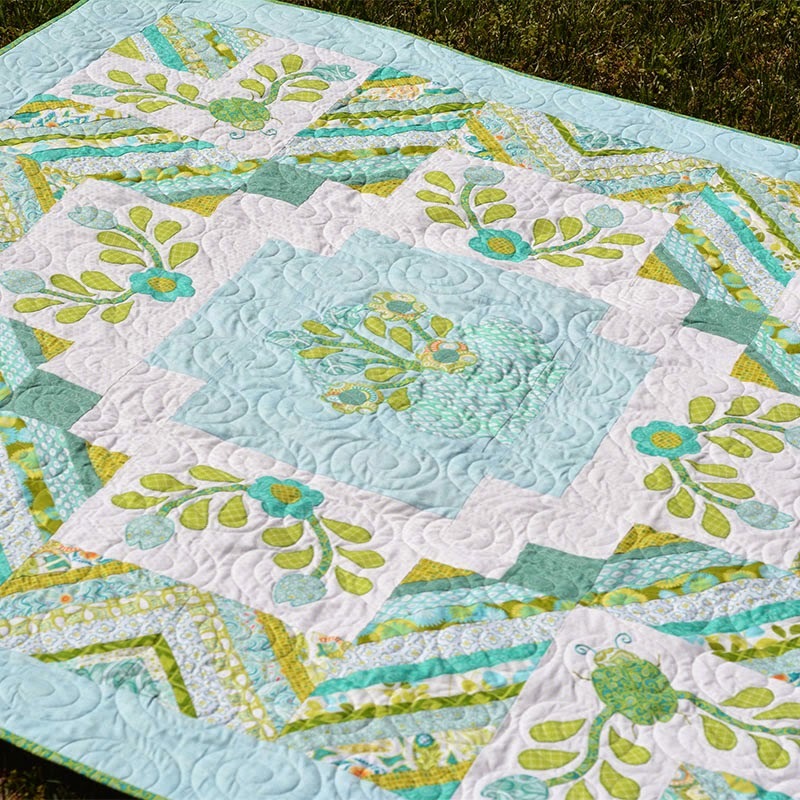 Such pretty fabrics and adorable quilt design! always such a treat to see your quilts Amanda. fingers crossed for this win!!! I like daisies, sweet and simple. All time favorite flower is Lilacs. Of course, living in SW Florida its' too hot for them, that makes them that much more special. Amanda, your color choices and patterns never cease to amaze me. They are soft, pleasing to the eye and beautiful. My favorite flower is the large and lush Peony, now making it's appearance in our garden, a feast for the eyes. Thank you for sharing your beautiful quilt and your fun picnic. Favourite flower is 'Forget Me Nots". So tiny and sweet. Beautiful quilt. Love the colors and your new pattern is adorable. Favorite flower: Not a clue. Too many to choose from. Love them all. I love your sweet ladybug quilt, but what caughtmy eye is your great label. Good job Grandma! My favorite flower is the mini daffodil. Its cheery color and mini size just make me smile! Sincerely, Paula K.
I love your ladybug quilt. I think it would be great if you made it into a pattern. My favorite flower is a rose. I love the smell of them and love how they look when I pick them and put them on my table. What a gorgeous quilt, Amanda! It would make any picnic special! My favorite flower? That's tough. Maybe a gardenia for its smell. Or a rose for it's beauty. Or a zinnia for its color. ??? I love them all! Having a removable laminate back is a super idea. I love that the quilt celebrates ladybugs without being red and black. My favorite flower is lily of the valley. I love tulips. 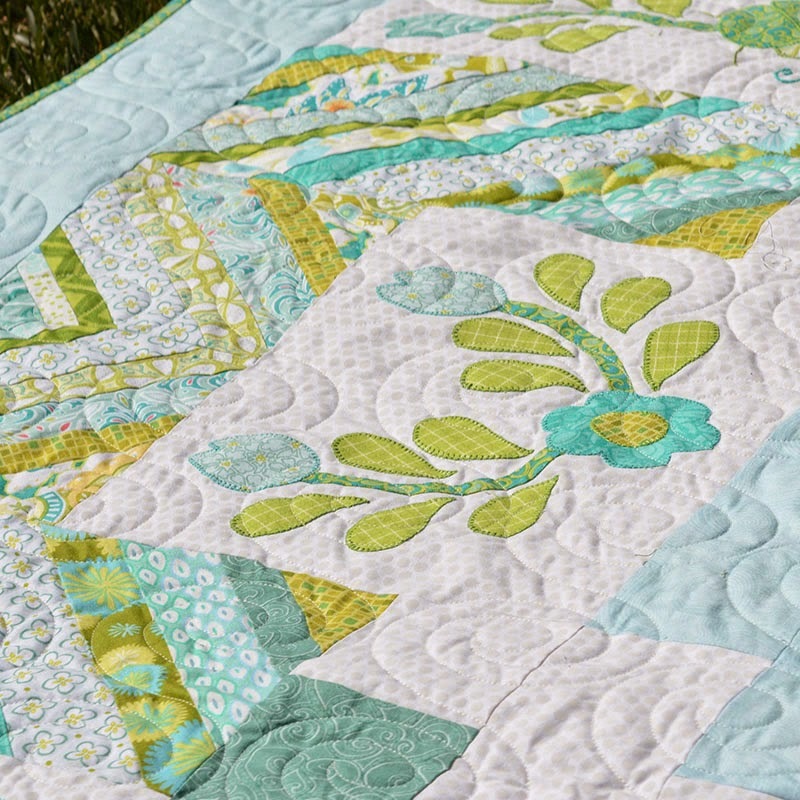 Your quilt is beautiful: go for the pattern! Picking one is hard...Sunflowers if I have to pick one. Amanda, your pretty quilt would make a picnic even more fun, and the protective back is genius! My favorite flowers are sunflowers, maybe because I grew up in Kansas and now I'm a Texas gal. Thanks for the giveaway! LOL - that song was 1,2,3; 4,5,6, 7,8,9 ladybugs came to the ladybug picnic. And yes, it was Sesame Street which my 3 kids watched daily in the 70's. My favorite flower is the Rose. Thanks for the chance, Amanda! So soft and so sweet! I love it! Oh my, Amanda, this is just gorgeous! The fabrics, the design, the quilting...you are amazing! Being able to get the pattern in a PDF would be great. I love tulips in any color. Thanks for sharing your picnic! Your picnic quilt is adorable. I love the relaxing colours and the applique. Please do write this one up as a PDF pattern. My favourite flower is the daisy; always fresh,always cheerful. Thanks for sharing and offering a giveaway. I love the lady bugs! My favorite flowers are daffodils. For some reason, I love the simple Daisy. Oh, and yes, we had a beautiful sheep dog named Daisy and she was wonderful. Now I have one named Rosebud and before that it was our Miss Lily. Yes, I do think you should make a pdf of that lovely picnic quilt although if I made it I would think twice about putting it out on the grass. It's too beautiful. 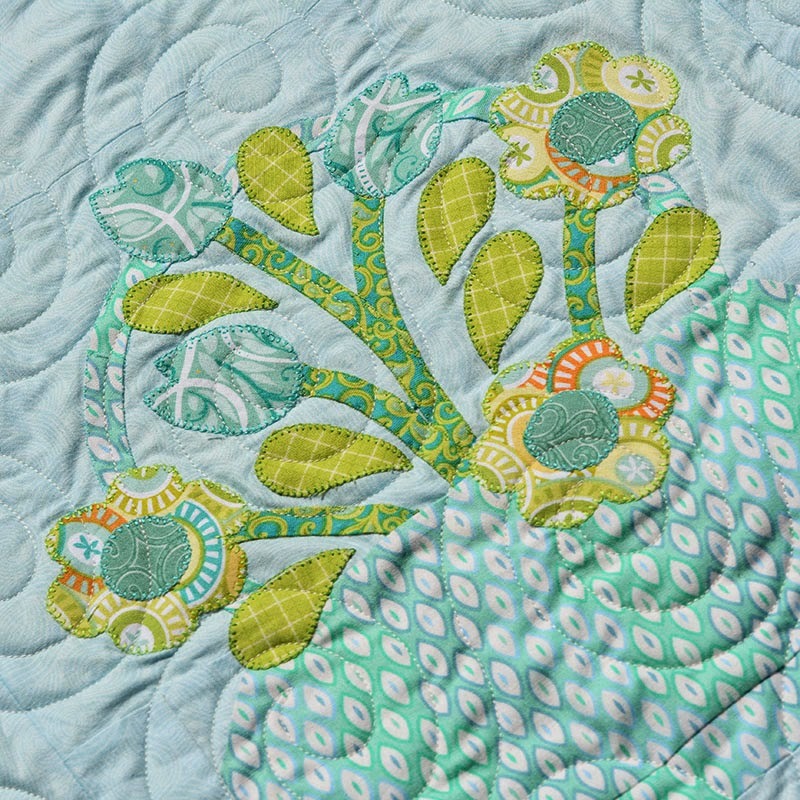 I love a good peony :) Your quilt is beautiful, thanks for sharing! I would love to see this beautiful quilt in a pattern. 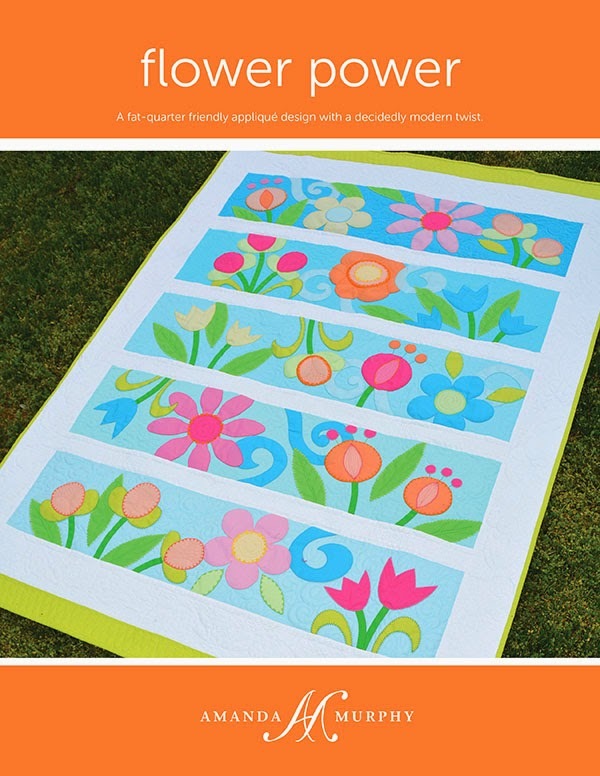 I am not a fan of sewing applique, but this is one quilt I would make! My favorite is a peony. This quilt brings back memories of watching Sesame Street with my daughter and her singing with them "Ladybug Picnic". What a beautiful quilt! I love tulips...which they lasted longer! wonderful quilt, very ambitious. Thanks for the give away. I would say my favorite is a toss up between roses and daffodils - one for spring and the other for summer! So pretty, I love ladybugs! and my favorite flower is the day lily that is growing in my garden right now. The colors are luscious. Beautiful quilting on that lovely pattern. Wonderful. My favorite flowers are peonies. What a cute quilt. Thanks for sharing and for the great giveaway. I love too many different flowers to pick just one favorite -- my grandmother had beautiful lupines, gladiolas, sweet william and so many more flowers in her gardens and my mom has a lovely row of peonies on her lawn. I love them all! 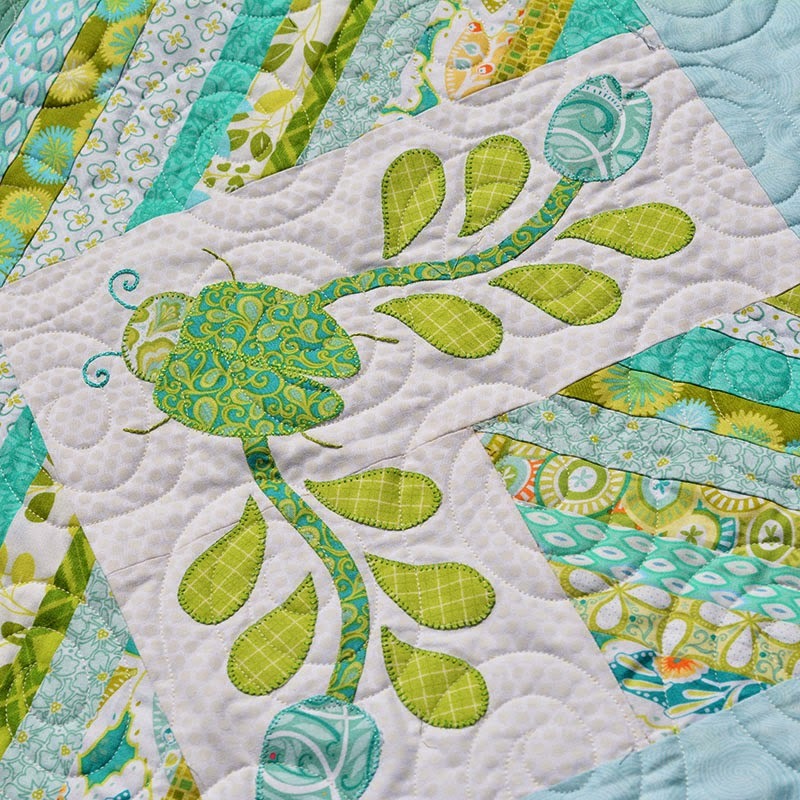 And yes, please, please a pdf of the ladybug quilt! Love the lady bugs! I would be with your daughter in thinking they belong OUTSIDE, not in but we all know that mother nature has other plans sometimes. You did a great job on the quilt and the aqua fabrics are wonderful. Making the laminate removable for laundering or other uses where being waterproof is not required is inspired. My fav flower?? Hmmm tough question but I am going to pick zinnias. First flower I ever grew successfully as a kid and I still love them. A quilt in my favorite colors! 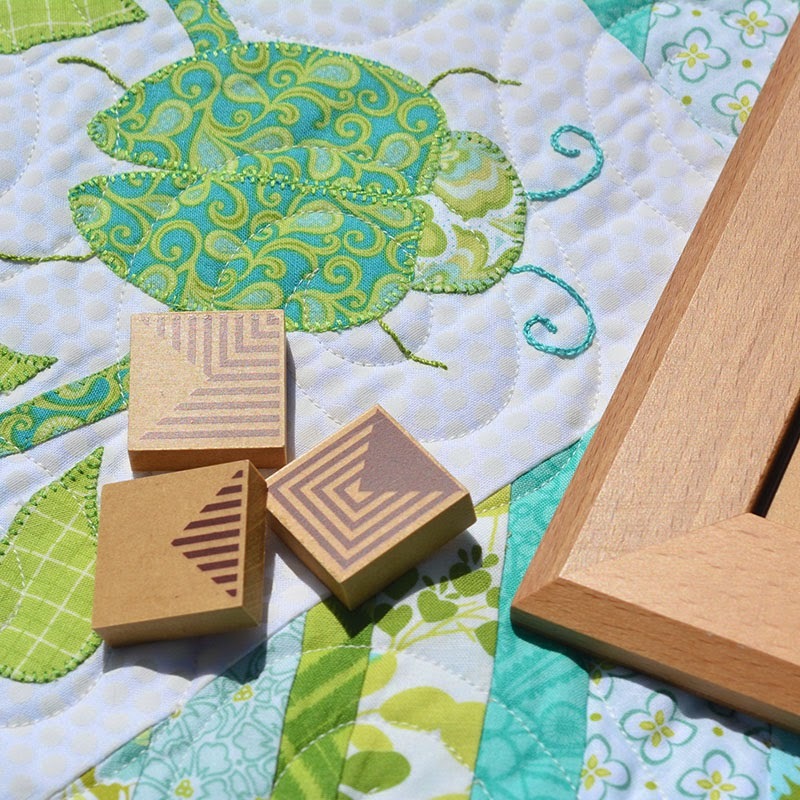 :) I like the symmetrical herringbone blocks and how they create movement completely around the quilt. Good idea. Also love the removable laminate back. Your the second hopper I've seen do that and I think its such a clever idea. Daisies are one of my favorite flowers. What a wonderful quilt and gorgeous colors! Thank you for sharing. I love your quilt, and my favourite flowers are delphiniums. such a gorgeous quilt pattern! My favorite flowers are lillies. Except for the yellow dye that I always end up getting on my clothes, just when I think I have removed all the stamens! My favorite flower is the hydrangea but roses and irises are close behind. Your quilt is really beautiful, Amanda. I love the colors--very soft and summery. Ladybugs are my favorite of all the bugs. Thank you for your giveaway. My favorite flower is the yellow rose. 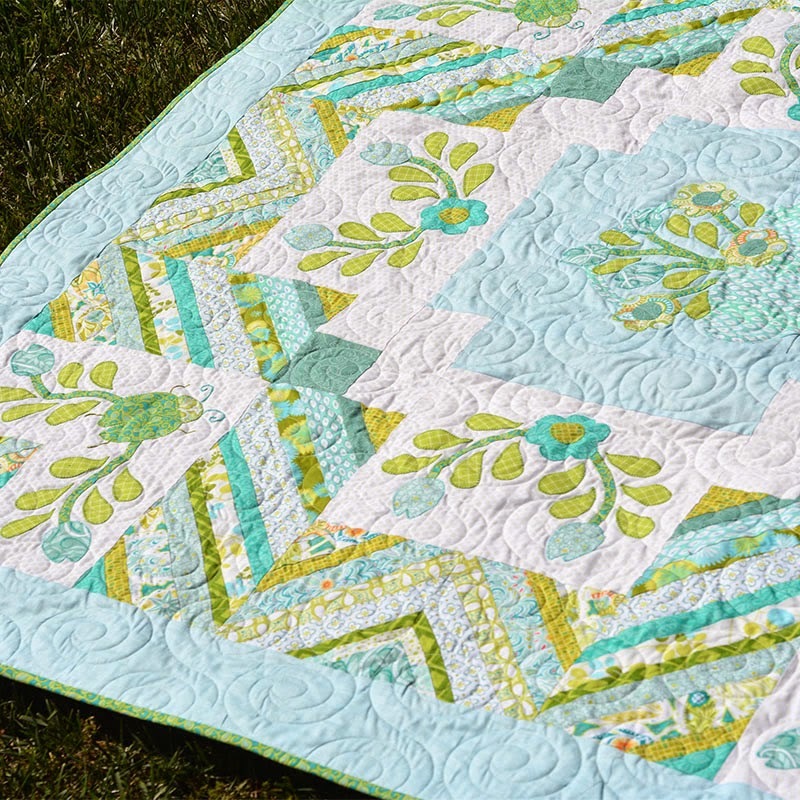 I love your quilt and you definitely need a pdf pattern! I loved the ladybugs and your colors! I love so many flowers it's hard to pick, so I'll go with daffodils at the moment. Thanks for the giveaway! I love tulips. What a gorgeous quilt! Your Quilt is AWESOME! & your muffins sound Delicious too!! YUM! I love sunflowers. Your ladybug picnic quilt is adorable! I love daisies. They are so simple and can go with everything. They bighten up every room! Pink English roses with their delicate perfume scenting the air - pure bliss. Give me a beautiful rose any day! Fabulous quilt and I love how the eye travels around---so fun for a picnic!! My favorite flower is the pansies--all colors; plant them every year. Thanks for the wonderful giveaway. Wow, Amanda, your lady bugs are beautiful. I just really like your details in this one. So sweet. My favorite flower? Around here some people call marigolds weeds, but I love how they will grow about anywhere. Love that pattern Thanks for the great giveaway!! Love all your patterns and fabrics! My favorite flower is the daffodil. I love tulips in the spring and orchids anytime! Thanks for the giveaway opportunity! love your blog! Tulips are my favorite flower. Your quilt is lovely I like the colors you chose. Thanks for the giveaway. Amanda, your quilt is so beautiful. Because I do not have the patience for appliqué, I can really admire those who are experts and you are one. The other part I thought was wonderful and I wish I had thought of, was the remove able laminate backing! As you can see by the number of people who have posted, you have inspired many of us! Your quilt is absolutely beautiful! Your piecing and applique Ts perfect and I love the fabric you choose. When you said the picnic quilt is bold I couldn't even dream a picture. WOW. When I saw IT Blew MY Mind. I think I'm in love. I love the colors and design. YES, YES! You definitely need to make this a PDF. I'll be first in line to buy. Love it. I love the flower Power pattern also. I want it also, would be great to win. My favorite is hard to say because I'm really a flower person. Having to choose I'd have to say the Lily of Valley. It's my birthday flower and I just think they are so delicate looking. Thanks for the giveaway. 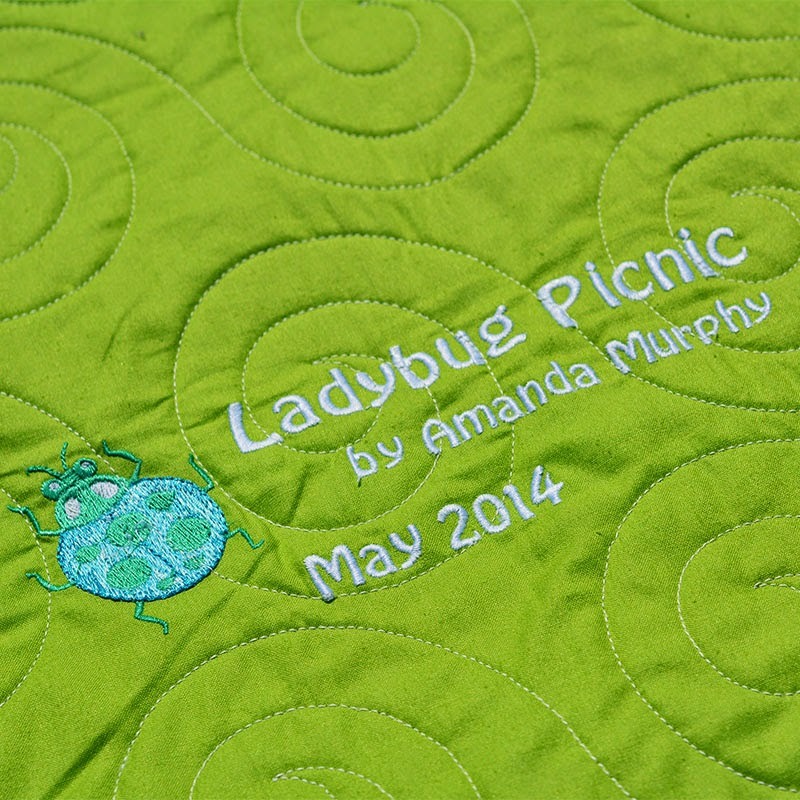 Your Ladybug Picnic quilt is just gorgeous!I hope you do offer it as a pdf pattern. My favourite flower is a rose. Love your lady bug quilt! The design with the appliqué is stunning. You should definitely make a pattern for it. If I had to pick a flower I love the most......, well I love them all as long as the flower is not connected to the end of a weed. I love your ladybug picnic quilt and flower power. It would be fun to try them out in fun spring colors. Your picnic quilt is lovely, some of my favorite colors! :) My favorite flower . . . a tough question because I do love them all. This week is it lilacs, because they are still filling my house with their intoxicating scent! Such a lovely quilt... great idea to back with laminate. My favorite flower this week is lily of the valley. What a fun blog hop! That is a beautiful quilt - too beautiful for sitting on, I think. :) I loved your idea for the detachable laminite fabric backing. I JUST LOVE flowers - most any kind. Sometimes it's whatever happens to be blooming in my garden at the time. I do love my bleeding heart LOTS! I have been trying to remember the name of that song for months - thank you! My kids used to sing it and I only remembered "they fell on their backs and they fell on their faces". Beautiful quilt and a PDF would be great! My favorite flowers are tulips. My favorite flower is the lilac. What a beautiful picnic quilt! In time for Easter... just!